With their show Andreas and Chris Ehrlich filled a complete soccer stadium. This is an official Guinness World Record. It is also outrageous that more than 1 million spectators visited the former tour of the Ehrlich Brothers. With their worldwide unique illusions, the Ehrlich Brothers already performed shows in the USA, Oman and on the Bahamas. So far they received 13 awards for their performances. Andreas: “Far too often dreams disappear in everyday life – but in our show miracles become a reality.” During the show “FASCINATION” you will witness how mothers in law from the audience are teleported from one place to the other and they will dare an experiment, in which one of the two brothers will be shrunk. Their production reminds of the big Las Vegas show of Siegfried & Roy. To transport the props and the lavish scenery 12 trucks and a crew of 70 persons are necessary. More than 30 kilometers of cables have to be installed and over 500 pyrotechnical special effects will be shot. For the final touch of the show they worked together with the director of the Helene Fischer Tourshow. Their light designers were also responsible for TV productions such as “Idols” and “Let’s dance”. 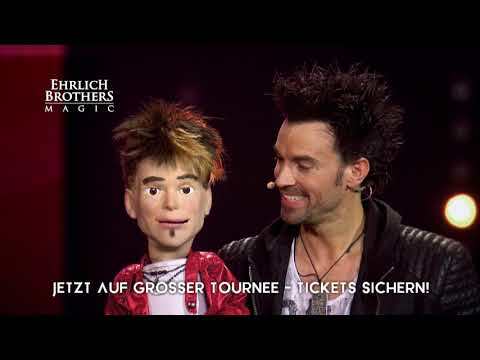 The Ehrlich Brothers are two German magicians who achieved worldwide fame and take their audience into a unique fascinating world of illusions. Add your details if you'd like to receive the Ehrlich Brothers' magical newsletter and look forward to spellbinding insights into the Ehrlich Brothers' TV appearances, shows and special events.